There are five stages of Ironman training. I’m not describing the process of periodisation, but the emotional journey played out race after race in the archives of this blog. The Outlaw triathlon is less than a week away, my first race in nine months and I have reached the final stage – acceptance. I entered the Outlaw comfortably in the first stage, optimism. There were problems, motivational issues and a run injury, but these would be overcome and I’d race well. It wasn’t long before pragmatism took over. Training was tougher than expected, my focus was coaching; I was making progress, but I’d not hit all my goals. There was still time. Then came realism – perhaps I’d improved in some areas, but there was much I’d failed to achieve. Expectations needed adjusting; there was time, but not much of it. At the peak of training I entered the fourth stage, pessimism, not a place I like to be. 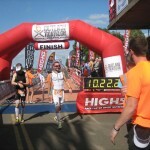 Motivation failed me, I struggled, doubting my ability to perform or even the purpose of racing. Finally I reached acceptance. I am racing and I’ve been there before. It won’t be perfect, but then it never is. I can still gain a lot from the experience, not least breaking the nine month drought of competition. It’s not easy racing when I feel so far short of expectations, but at some point I have to make a start line. Although I’m past last week’s pessimism I’m still looking for clues to my potential. How painful will the swim be? Can I really push the bike that much? Will a run/walk strategy actually make the marathon bearable? Only racing can answer these questions, but it doesn’t stop me searching through my training logs. The first answer is easy, the absence of pool time is ample evidence. The swim will not be fun. My only hope is that fitness will compensate for what may be my worst swim form. No excuses, motivation has been low and I chose not to train; I’ll suffer the consequences. If this morning’s session is anything to judge by I will be lucky to hit the hour. I have worked hard on the bike and believe I’m stronger for it, but you can never know how you’ll perform. 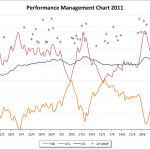 The best I can do is compare my peak training over a year of events and look for confirmation of those improvements. Hours are down in comparison to 2010, this is the least riding I have done before a major race, but it’s also the hardest. 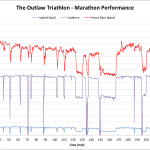 The right shift in my power distribution for the Outlaw demonstrates I am doing more work. It’s a confidence boost. 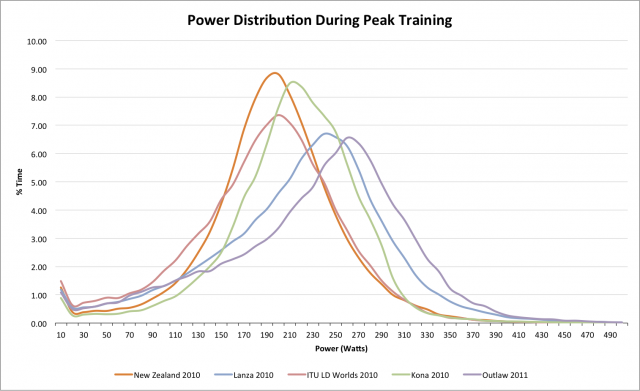 A confirmation that I’m training better; the hours may be lower, but the effort is there. I rode well in Kona on fewer hours and higher intensity, I’ll look for the same again. The data set has flaws, missing power from training and races, but I’m willing to use it as a sign I can race harder. This is my opportunity to test myself and find out just how hard that is. The gains I’ve made on the bike have come in the absence of running. It’s easy to see how I started the season optimistically – I was managing a reasonable mileage, but repetitive strains derailed progress. More than the other sports my ability to run has been tied to my mood; failing here dragged motivation down. My recent work with Kinetic Revolution has restored some optimism, running feels good again. 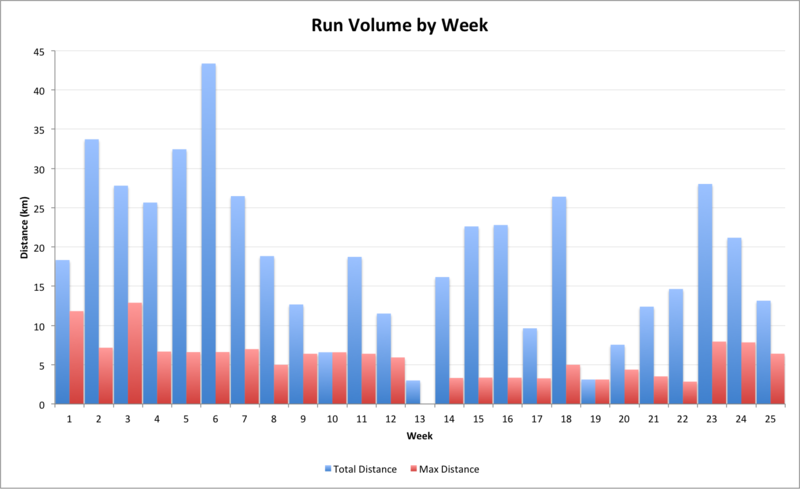 With new technique I can run well, but the lack of volume and the absence of a long run doesn’t inspire me. This won’t be my first race on low volume, Kona followed two months of zero mileage. I will not be repeating the strategy of running hard until you have to walk, instead a controlled run/walk should improve my experience. Three kilometres running, one minute walking will hopefully be manageable. The run will be tough, but perhaps not as bad as I feared. Ultimately I’ve accepted I’m not as prepared as I should be. I won’t make excuses; I have my reasons, some of them good. I’m looking forward to a return to competition, but I’m nervous at the prospect. All I can do is approach it like any other race – go as hard as I can on the day and enjoy the process.